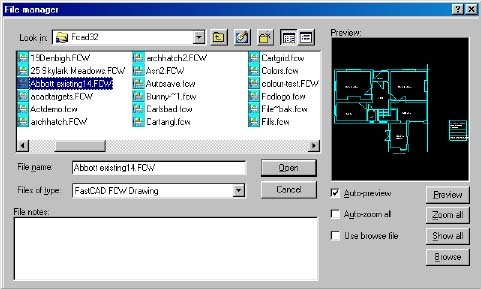 Producing fast and accurate drawings with FastCAD and EasyCAD has never been easier, thanks to our range of productivity tools. These tools perform a number of different tasks, giving you lots of extra functionality and reducing drawing time. The most widely used FastCAD addon in the UK. Comes with every thing you need to get started in CAD, from metric borders to UK libraries. UK based libraries of commonly used components in both pull down and on screen drag and drop formats. Mechanical , Electrical , Plant & Pipe, Process , Structural and many others. Hatching has never been as simple and fast as now. ProHatch allows you to select a group of entities and then drag out a hatch pattern to fill any area. No longer do you have to turn boundaries into polylines and the most complex shapes can be hatched in seconds. You can even do cross hatching or two line hatching in the same command. This utility gives you extremely quick and easy object editing. In standard FastCAD, when you use Drag to move an object, you see the object moving on-screen as you move the mouse. This is called a dynamic cursor, and it takes the guesswork out of moving objects. ProDrag takes this idea of dynamic cursors, improves on it with shortcuts for user controlled scaling and rotation, then applies it to the other editing functions. The result is a set of commands which are easier and quicker for you to use without losing precision. This module includes the much demanded Drag Stretch command. This great little routine allows you to cut out and copy drawing entities that are bounded by a box, circle or polygon. You can either cut what is inside or what is outside of the boundary. Really useful for copying bits of surveys or maps, as well as producing exploded views.